More than 156,000 people with disabilities live in Hawaii. This number includes 66,031 who are working age (18 to 64). Of that population, an estimated 39.9 percent are employed, leaving 60.1 percent out of work. In comparison, 78.6 percent of working-age Hawaiians without disabilities are employed. Hawaii ranks 18th in terms of employment rate for people with disabilities in the U.S.
Ige’s responses to the questionnaire can be found below. Answer: A key area of policy that is working to reduce stigma and advance independence for people with disabilities is in the employment arena. We see employment of people with disabilities as a civil rights issue and closing the employment gap is a key strategy that will benefit the entire community. Members of my administration are working to establish Hawaii as an Employment First state, and I am steadfastly committed to making this happen. 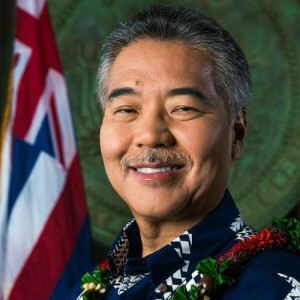 Hawaii is actively implementing requirements of the Workforce Innovation and Opportunity Act (WIOA), and we have laid out our vision for pathways to employment that combines both federal and state planning mandates into a single document (https://labor.hawaii.gov/wdc/files/2012/11/Hawaii-WIOA-Unified-State-Plan-April-12016-Final-Final.pdf). As well, Hawaii’s Department of Health-Developmental Disabilities Division (DDD) is prioritizing employment supports through a redesigned employment suite of services in their newly implemented 1915(c) Home and Community Based Services Waiver for Individuals with Intellectual and Developmental Disabilities (IDD) (http://health.hawaii.gov/ddd/participantsfamilies/employment/). A core initiative is the Jobs Now Partnership (JNP) facilitated by the University of Hawaii Center on Disabilities Studies (CDS) (https://www.cds.hawaii.edu/cds-projects/jobs-now-partnership), which is working with local high schools to support students with intellectual and developmental disabilities in their pathway to employment. This effort is led by Dr. Patricia Morrisey, Director of CDS and President of the U.S. International Council on Disabilities since 2014, and past Commissioner of the Administration on Developmental Disabilities (2001–2009). Answer: Improving the lives of people with disabilities remains central to my policy agenda. I have supported successful rate increases though my Executive Budget request for the 1915(c) IDD waiver that has a central focus on community integration through employment and the promotion socially-valued roles of people with disabilities. Hawaii is a member of the State Employment Leadership Network; one of DDD’s strategic goals is that individuals with IDD will have opportunities to seek employment in competitive integrated settings (http://health.hawaii.gov/ddd/files/2017/11/DDD-Strategic-Plan2018-2020.pdf). Nationally and in Hawaii, people with IDD have historically been unemployed or underemployed despite their ability and desire to work in the community. Many have been placed in “prevocational” programs and segregated workshops where they are paid sub-minimum wages with little expectation of moving into integrated employment. It is my commitment to change this trajectory, make sure people don’t get stuck in a pre-vocational setting, and stop the use of segregated work programs. The array of employment services in the HCBS waiver range from Discovery and Career Planning to Individual Employment Supports that includes job development and job coaches. Answer: A core initiative is the Jobs Now Partnership (JNP) facilitated by the University of Hawaii Center on Disabilities Studies (https://www.cds.hawaii.edu/cds-projects/jobs-now-partnership), which is working with local high schools to support students with intellectual and developmental disabilities in their pathway to employment. This pilot demonstration is a partnership with five agencies and will assist high school sophomores to seniors develop and achieve individual employment outcomes. It is actively engaging families in the process. The State also recently obtained a federal award for $2.25 million to help prepare youth with disabilities to enter the workforce or post-secondary education. The funding allows participants to obtain paid work experience and employment preparation activities. Answer: The DDD has an Employment Specialist on staff who supports I/DD waiver provider agencies development their employment supports planning and practices. DDD has adopted the LifeCourse Framework out of the University of Missouri at Kansas City. This planning framework assists families to begin planning for an inclusive productive life at early life stages, and has been embraced by human service agencies and the community and (http://health.hawaii.gov/ddd/participantsfamilies/lifecourse-framework/). The Centers for Disability Studies operates the Postsecondary Support Program funded by DDD and the Division of Vocational Rehabilitation. It provides oncampus coaching and support to students with disabilities in a variety of post-secondary educational settings and employs educational and peer coaches. Answer: A key initiative of my administration is to modernize our correctional facilities to provide for a more secure, safe, and humane environment for those in custody. Modern facilities will be better able to provide programs and services for detainees that will better enable them to be successful and integrate with society when they leave incarceration. Answer: Protecting vulnerable citizens is an important priority for my administration. The Developmental Disabilities Council under the Department of Health provides support to the Self-Advocacy Advisory Council (SAAC). This has been a successful model for empowering people with disabilities to become leaders and to advocate for themselves on a variety of levels, from personal to policy. SAAC has grown exponentially over the past several years, with chapters on each of the main Hawaiian islands. SAAC members have a grant through the DDD to teach the curriculum “Feeling Safe, Being Safe,” that helps prepare individuals and neighborhoods for emergencies of all kinds. While the curriculum is focused on emergency situations and natural disasters, it has brought awareness about personal safety to the forefront. DDD has also implemented training on sexuality and people with disabilities for case managers across the state. Answer: An important consideration for any individual receiving Medicaid health benefits is how work may impact their eligibility and access to those services. While a few people may be able to work in places where they can receive employer-sponsored health care, the reality for individuals served by the public sector who want to work is that most, if not all, will continue to need health care and other supports through Medicaid. DDD made significant improvements to the 1915(c) Waiver for Individuals with Intellectual and Developmental Disabilities (I/DD Waiver) by creating clear expectations and a mechanism to pay for Benefits Counseling as part of a service called Discovery & Career Planning. DDD contracted with the Centers for Disability Studies to train a cadre of people who have gone on to become Certified Benefits Counselors through Cornell University. A second class is working on their certifications currently. The IDD Waiver has approximately 15 benefits counselors available to work with individuals enrolled in the waiver as they begin to think about working. Individuals who are already working can also use Benefits Counselors to guide them if they get a raise or are interested in seeking a promotion, more hours, or a different job. Another important tool for individuals with disabilities to use to save money without risking their eligibility due to asset limits are ABLE, or Achieving a Better Life Experience Act of 2014, savings accounts. Hawaii is among 37 states and the District of Columbia that have ABLE programs. Hawaii passed its ABLE law in 2015 and is moving toward implementation. Answer: Supporting people with disabilities to live in their own homes or homes in the community is a core commitment of my administration, and the state has been very successful in this area. The only institution, the Waimano Training School and Hospital, closed completely in 1999. According to the most recent State of the States report published by the University of Colorado, 79% of people with an IDD in Hawaii live with a family caregiver, and another 17% live alone or with a roommate; only 4% live in a supervised residential setting. Only 5% of Hawaii’s spending is on ICF/IDs versus the national average of 18%. The HCBS waiver serves the vast majority of people in Hawaii who meet an institutional level of care and none live in institutions by definition; the majority live in a family setting. Answer: Assistive technologies are a key way to promote community integration and in Hawaii can be accessed through a variety of means including through the HCBS waiver and Assistive Technology Resources of Hawaii. In terms of advancing innovations, State staff have looked at Ohio’s Technology First Executive Order, which is acting to expand access to technology for people with developmental disabilities. They have attended conferences that have presented on the Ohio DDD programs, and have learned about the advances in remote supports. We think this is a promising approach and will be looking more into the important advances in this area and what it might take to build a similar initiative in Hawaii. Core websites such as the DDD and UH-CDS websites are also fully accessible. DDD contracts with UH-CDS to create accessibility including attachments and links whenever possible. (http://health.hawaii.gov/ddd/ and https://www.cds.hawaii.edu/). The UH-CDS Media Center provides a full range accessibility consulting services to help organizations maintain compliance with Section 508 and ADA Title III. Their services include: Website assessment and repair, video captioning, document accessibility, and accessibility training.